As a homeschooling Mom, do you often wish you had a worksheet for a specific skill your child is struggling with? Do you have younger children who love to complete a worksheet in order to ‘do school’ like their big siblings? I know I’ve often given my preschooler a used worksheet to scribble on during school, or searched the internet for a free worksheet for older children to practice math facts, or reading comprehension. When I got the opportunity to review Super Teacher Worksheets I was so excited. It seemed like the perfect solution to so many needs- all in one place! We received the Individual Membership to Super Teacher Worksheets fro this review. This site offers a paid yearly subscription, to print off as many worksheets as needed for a whole year. No more searching the internet for a perfect worksheet! I was SUPER excited about getting my log-in information so I could start using the worksheets, but when I signed on I was dumbfounded by the sheer amount and great quality of the worksheets available, plus the wide range of ages and subjects covered. I knew before signing into my member account that I would find many great worksheets to meet our needs, but after signing on I knew that I would never need to look anywhere else for a worksheet again! I’m amazed, really! I can’t even begin to tell you in a single blog post about what is available over at Super Teacher Worksheets, so I’m going to share my very favorite ways (so far) of using the worksheets. But, I must say I feel that I’ve barely scratched the surface of the possibilities! My 4-year old preschooler, Emily completes a minimum of 2 worksheets a day- often begging for more! Her favorite worksheets are the mini-books. She colors a page a day, and a few days later we staple her sheets into a little book. She carries her Farm and Pumpkin Counting mini-books everywhere and ‘reads’ to anyone who will listen. She also practices her handwriting, letter recognition and shapes/colors using the many available worksheets. My favorite resourses for my 1st grader are definitely the phonics and reading worksheets. Peyton needs more practice than her curriculum provides and we’ve found so many fun worksheets to make that review enjoyable. 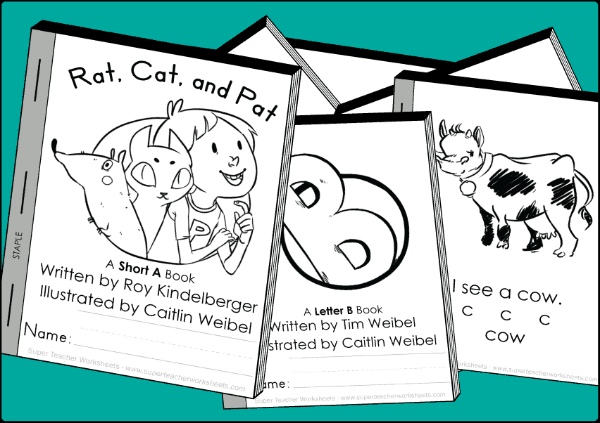 She, like my preschooler, loves the mini-books, which have several early reader options. We’ve also used word wheels and general phonics worksheets to review and solidify skills before moving on to the next thing. When her required school is finished she often asks me to print a color by number sheet or a cut, color, & glue craft to complete for fun. 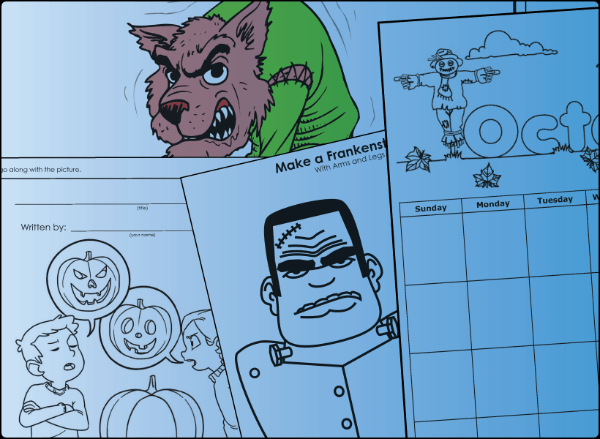 All my children ask to complete the fun seasonal, educational worksheets. I know I better print those worksheets 5 at the time! 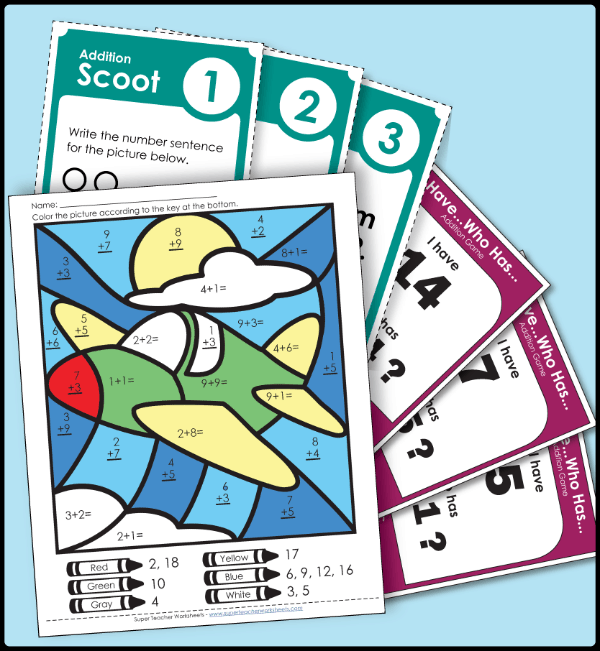 There are also so many worksheets available to meet the needs of my older children, from fun math practice sheets (color by number and math mysteries), to reading comprehension, to spanish, science, and social studies. I think it’s funny and wonderful when the children ask to choose and complete a worksheet (or several) outside of school hours! The puzzles & brain teasers are the most asked for category, though others often peak their interest. If you like using worksheets in your homeschool, you definitely need to check Super Teacher Worksheets out! Follow Super Teacher Worksheets on Facebook, Twitter, Instagram and Pinterest. These look great!!! I think the seasonal ones are my favorite from your blog.